Our first Encinitas City Council meeting of 2016 was replete with exciting issues. Read on for details! We heard an update on a proposed “quick-charge” all-electric vehicle charging station in City Hall’s overflow parking lot on Vulcan Avenue. Under the proposal, electric cars would be able to recharge their batteries in 13 minutes at a cost of about $4. The charging station would come at no expense to the city, and the city would collect lease revenue from the applicant, Corridor Power, Inc. Charging would be free for Encinitas’ residents and city-owned vehicles for the first three years. The solar panels above the plug-ins create much of the electricity. The proposal is a three-year lease with a payment of $1,200 to the city per year per parking spot used. Of the 25 currently existing overflow parking spots, seven would be lost to the driver’s lounge, eight would remain public and 10 would be used in rotation for quick charging. A 24-hour attendant (also at no cost to the city) would help move cars around and leave spots available for the public during non-peak or event times. This is an innovative, climate-cooling demonstration project that is economically viable because of federal and state grants and other contributors. 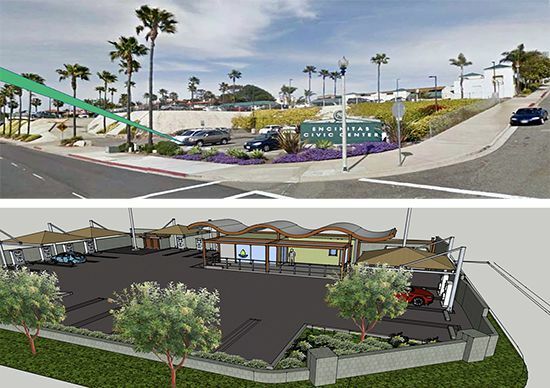 It seems like a great fit for Encinitas, given our city’s proactive environmental focus. Encinitas doesn’t have any other “quick-charge” stations — the closest one is at the Carlsbad Outlet Center. The long-term success of electric vehicles is dependent on a continuous network of charging stations, and I’m hoping we can do our part to help promote this important forward-looking technology. We directed the city manager to move forward with filling in more details of the project. At top is the current City Hall overflow lot (which used to be a gas station!). The Electric Mobility Center proposed for the site is shown below. We voted 4-1, with Deputy Mayor Lisa Shaffer opposed, to immediately replace the substandard dirt lot at Leo Mullen Sports Park with artificial soccer turf. These soccer fields are an embarrassment for the city. The hefty $1.2 million price tag is hard to swallow, but it’s important that our heavily used sports facilities are adequate. Soccer is a popular, competitive, healthy activity for a large number of Encinitas’ families. Leo Mullen field this week. The field is closed 60-90 days a year to attempt grass rehabilitation. When the field is open it gets so much use that it’s often dry and brown, with the dirt as hard as concrete. 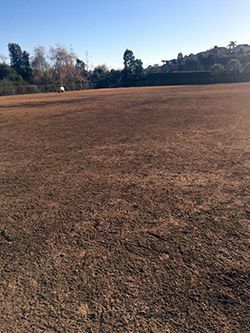 The city doesn’t have other available fields for the Encinitas Soccer League, and for more than 10 years this field has been at the heart of the League’s program. More than 1,850 soccer players were in the league last year. The City Council approved two items dealing with housing insecurity in Encinitas. Mayor Kristin Gaspar proposed a $100,000 commitment to Interfaith Community Services, an organization that uses a “housing first” model to get people off the streets. Interfaith’s proposal explains that for the majority of the homeless, and particularly for veterans, there are sufficient social service resources to provide housing, mental health, and substance abuse treatment. But too often the homeless are unable to access, navigate, find or afford those services. In this one-year pilot project, every Encinitas homeless person will be assessed. A housing navigator will match at least 25 people with homes, and many others with needed services. The project requires close collaboration with the Community Resource Center, the Sheriff’s Department, the Encinitas library, faith groups, Scripps Hospital, the City of Encinitas and community and business leaders. Homelessness is a growing problem in Encinitas, as in many cities. In January 2015, the annual point-in-time survey by the Community Resource Center showed 123 homeless people in Encinitas, with 80 on the street and 43 in shelters. A quarter of the un-sheltered homeless were veterans. In 2012, Encinitas had a total of only 39 homeless people. I’m grateful for a proposal to get started on a possible solution to this multi-faceted problem, and to have a collaborative approach among agencies. If you’d like to participate in this year’s point-in-time count on January 29th, starting at 4 a.m. at the Encinitas Community Resource Center in downtown Encinitas, please see this website for additional information on volunteering. The second related agenda item this week was about preventing seniors from becoming homeless. The Senior Commission proposed spending $15,000 on a coordinator to match seniors in a HomeShare Program so they can age in place, while other seniors are provided with needed housing. Some seniors have a home with extra bedrooms and may be looking for someone to either provide extra income, or help around the house with cooking, cleaning, and errands. I like it when Council Members and City Commissioners have ideas, research them, and propose them to the city for action. I was happy to support both of these proposals this week addressing housing insecurity in our highly-priced city. The ACLU sued Encinitas over our very strict sign regulations limiting political and other non-commercial signage on private property outside of the 30-day window before an election. I’m happy the city settled this First Amendment lawsuit, which was based on relatively settled law. The city’s new sign regulations do not restrict when residents can have political and noncommercial signs in their yards. We announced a two-year labor agreement with the Encinitas Firefighters Association, which represents 48 full-time city employees. The city’s firefighters are already at the top of the pay range when compared with other cities in the county. The agreement involves no salary increases. This week I was honored to appear with the group above at a forum on Gun Violence Prevention. More than 90% of Americans support consistent background checks; consistency meaning that it doesn’t matter if someone buys a gun from someone on the Internet, from a gun show or from a storefront. The procedure to ensure that criminals, terrorists, youth, perpetrators of domestic violence, and the mentally ill don’t buy guns should be the same. 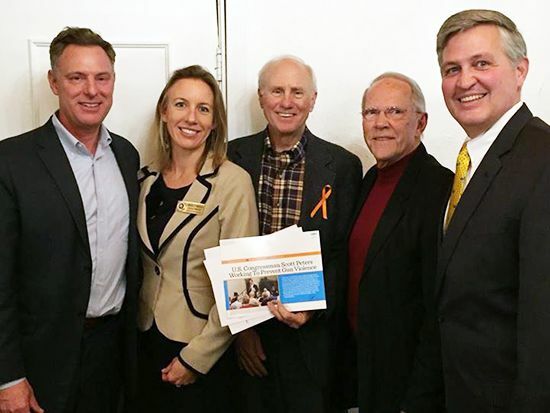 From left to right in the photo are Congressman Scott Peters, me, Steve Bartram with the Brady Campaign, Rev. Bill Harman and Supervisor Dave Roberts.